There’s something automatically programmed in all parents that makes us want to obsessively check in on our babies while they sleep. The Vetro Crib by Nursery Works is the first and only crib in the world that will allow you to peek in on your little one from every angle of the room. The crib is entirely made of clear acrylic. 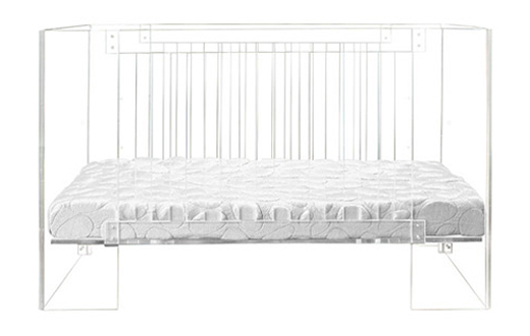 The patented design features curved edges, three level mattress heights and transitions into a toddler bed. Maybe knowing that the crib will turn into a small bed for your toddler will make the giant price tag on this beauty a little easier to swallow. The crib retails for $3500. Plus your baby will be in good company. Beyoncé bought the Vetro crib for her daughter Blue Ivy. That’s crazy! And I thought my Stokke crib was expensive!